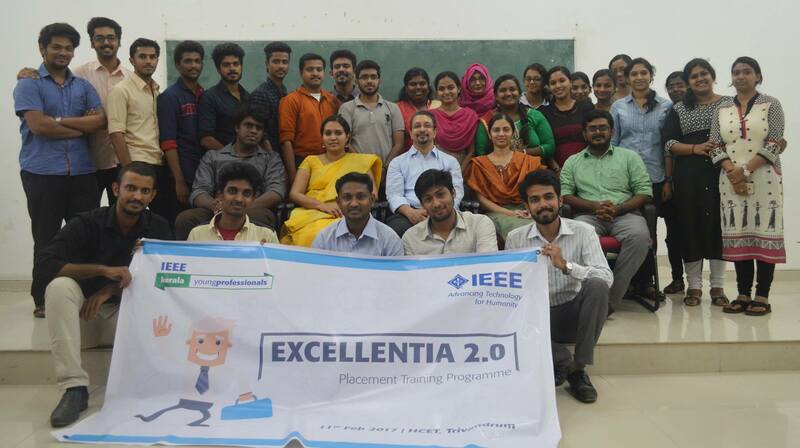 Excellentia 2.0, an initiative by IEEE Kerala Young Professionals to groom the students before their placements, was held on 11 February 2017 at Heera College and Technology, Thiruvananthapuram. It was aimed at imparting information to improve a candidate’s performance and to give a full-fledged insight on how to appear for a placement drive, delivering the rightly chosen information by reputed industry and subject experts. The one-day event began with Mr. RS Nithin, Volunteer, IEEE Kerala Young Professionals, leading the gathering through the IEEE Code of Ethics. Followed by, Prof. Srilekshmy S, Student Branch Counselor, IEEE SB HCET, welcoming the gathering. Dr. Prof.T Ruban Devaprakash, Principal of the host college, further addressed the gathering with certain key facts regarding what an interviewer expects from a candidate appearing for a placement drive. He also cited some thought provoking situations on how being human is more important than being an engineer and getting placed. He stressed the importance of having deep knowledge in understanding the basics of one’s area of specialization. 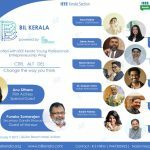 Followed by, Mr. Bibin P Thomas, Vice-Chairman, IEEE Kerala Young Professionals, felicitated the event and Ms. Shilpa Raman, SB Chairperson, IEEE SB HCET, delivered the vote of thanks hence, concluding the formal inauguration ceremony. The event witnessed an overall participation of 27 students from various colleges within Trivandrum. The first session on ‘Re-Discovering your Resume’ by Mr. JaiKrishnan Nair, Volunteer, IEEE Young Professional Volunteer and senior systems engineer at Infosys. The session covered everything from how a resume should look like and on the different subsections within it, to the Do’s and Dont’s. Brilliant inputs by Mr. Ajmal Shah on the topic also added an edge to the event. Followed which, Mr.Bibin P Thomas gave certain must follow instructions while attending a Group Discussion and on how to prepare for a Group Discussion prior to it. Grooming oneself being very important while appearing for an interview. Mock Group Discussions followed. The participants were divided into 4 groups and each group was given a topic to discuss for 5 minutes. Topics varied over the choicest current affairs in our country viz. Demonetization and its Effects, Smart cities, etc. The Mock Group Discussion session was indeed one of the productive parts of the event as the participants got a real time experience to analyze oneself as well as to understand how exactly one has to perform. The group discussion session was analyzed by peers and experts – certain valid criticisms were conveyed to the participants thereafter. How to prepare for an Interview which included researching about the organization, knowing about its mission and vision, feedback of the company. A resume is a window to the Interviewee’s personality. So to prepare the resume beforehand. Do not over-prepare and hence, make mistakes. The type of questions usually asked during an interview. With an emphasis on Scenario based, Competencies, Probing questions and about you. How to make one appear competent to the Interviewer, by conveying one’s skill and strength in a right way. Body language and soft skills during Interview. During the interview, In-Hand to carry like Pen, Resume, and Paper. The DO’s and DONT’s in an interview along with common Interview etiquettes. A mock interview for the students was conducted with two of our very talented and knowledgeable IEEE Young Professionals, Mrs. Anusha Anand (Sr. Project Executive, InApp) and Mr. Jithin Krishnan (Scientist/Engineer, SCTIMST), as the Interviewee. Both of them are experienced in taking Interviews in their respective fields and were very important assets to the IEEE Young Professional community. Last but not the least, Mr. RS Nithin took a brief session on the various Job opportunities that are out there, egging on students to find Internships with reputed firms and how Government also needs a pool of people with good technical knowledge in IT. An open forum was put on for the participants to clarify all their queries and a quick feedback was also taken.